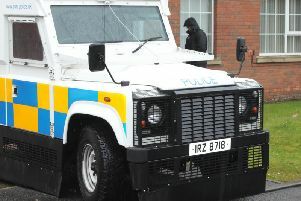 A Co Armagh man accused of aiding and abetting the abduction of a neighbour who was shot dead in a derelict house, allowed his car to be used in the fatal kidnapping, a court has heard. Gary Marshall faces a single charge arising from the February 1998 murder of Lurgan man Kevin Conway. Mr Conway was looking after his three-month-old daughter when he was taken from his home and driven a short distance to Aghalee. He was then taken to a derelict house at Rock Lane, where he was handcuffed and shot once in the back of the head. Marshall, from The Beeches in Portadown, is currently standing trial at Belfast Crown Court in a non-jury Diplock trial. The 48-year-old has denied aiding and abetting the kidnapping of Mr Conway, on February 17, 1998. Telling Judge Geoffery Miller QC there were “irresistible forensic links” to connect Mr Conway to a car which was possessed at the time by his then neighbour Marshall, prosecuting barrister Terence Mooney QC said it was the Crown’s case that Marshall provided his vehicle to the kidnappers. This forensic link, Mr Mooney said, was two-fold: fibres from Mr Conway’s shirt found on the back seat of the Vauxhall Nova, and debris from the murder scene being present in the front footwell of the car. As the Crown opened its case against Marshall, Mr Mooney said that at the time of the abduction and murder Mr Conway lived at Deeney Drive in Lurgan, while Marshall was staying with his mother at nearby Donnelly Gardens. The victim was last seen alive by his wife at 1.45pm on February 17, 1998, when she left their home for half an hour to pick up their two children from school, leaving their three-month-old daughter with him. When she returned home, Mrs Conway was unable to open her front door. She gained access via the back when she “found the baby on her own and her husband missing”. The prosecuting barrister also said there “strong inferences ... that the deceased did not leave his home willingly” – including the fact he wouldn’t have left the baby alone, he was wearing his slippers and he left behind his mobile phone. Mr Conway’s body was discovered by a farm worker at Rock Lane in Aghalee the day after he was abducted. His remains were found lying face-down on the floor, his hands had been bound behind his back and he had been shot once in the back of the head. Mr Mooney said that two days after the discovery, police investigating the murder seized the Vauxhall Nova which was registered to Marshall’s wife but which he had possession of. When the vehicle was seized, it was noted there were children’s car seats in the back, and both the interior and exterior had been recently cleaned. Judge Miller was told by the Crown prosecutor that the proximity of Mr Conway’s home to Marshall’s allowed Marshall to monitor his neighbour’s movements, domestic routine and “he would have been aware when Mr Conway was alone in the house”. When Marshall was arrested on February 21, 1998 on suspicion of involvement in the murder, he declined to answer any police questions. The court heard that when the forensic link – fibres from Mr Conway’s shirt found in the car – was put to Marshall, he then provided police with a pre-prepared statement. In the statement, Marshall claimed that Mr Conway had come out of his house while he was at the car, shouted “hey boy” to Marshall then ‘briefly leaned’ in the driver’s side and held out his hand to steady a car seat. Marshall was subsequently released without charge on February 27 of that year, but was rearrested in December 2013 when further forensic evidence came to light.